BEAUTY SUCCESS is a famous beauty care chain in France, which won the French title of the Best Beauty Care Chain in Cosmetics and Perfumes Brand in 2017 and 2018. After more than 300,000 consumers casted their votes, Beauty Success won with its outstanding service and more than 20 years of experience. In July 2018, Unitouch facial masks have officially based themselves in BEAUTY SUCCESS, the beauty care chain that consecutively won the title of the Best Beauty Care Chain in Cosmetics and Perfumes Brand in 2017 and 2018. The facial masks are being sold at 520 shops and on the internet, with Unitouch’s pioneering BAD GIRL series at around NT$270 (€7.5) each, and MISS O series at around NT$250 (€5.9) each. Unitouch’s BAD GIRL series of facial masks uses gold and silver grids to form the mask, which are highly conductive and able to transmit the essence to the bottom of the skin. The mask carries gold and silver ions, plant stem cells and liposomes, while also uses top-class plant-based essence oils to replace chemical aromas, as well as mild, non-allergic and chemical preservative-free recipes. The product is a good for young women as a refreshment after work, care before putting on makeups, post-sunburn repair, water supplement for exercisement or a way of relaxation and nourishment. The five facial care features are designed to supply you with all the energy you need to be a BAD GIRL. Unitouch’s MISS O series of facial masks take a unique, amiable full-round shape as its base, and developed five different themes of travel, pre-makeup, post-sunburn, good night and party. They are designed to provide facial mask nourishment for skins under different situations. The whole series use top-class plant-based essence oils to replace chemical aromas, as well as mild, non-allergic and chemical preservative-free recipes. Unitouch has been awarded seven Les Victoires de la Beauté awards in four consecutive years, with positive opinions from French judges, and has seen good sales in high-end department stores in Paris. 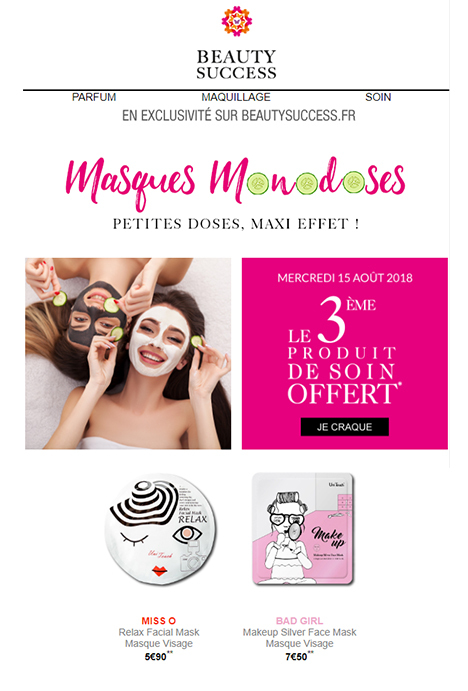 Unitouch’s top-class essence oil facial masks have been sold from LVMH group’s Le Bon Marché department stores, the top beauty care retailer SEPHORA, the well-known French health and beauty care store of Monge, French beauty care chain BEAUTY SUCCESS and HEINEMANN in Munich airport, Germany. They have been sought after by consumers around the globe.